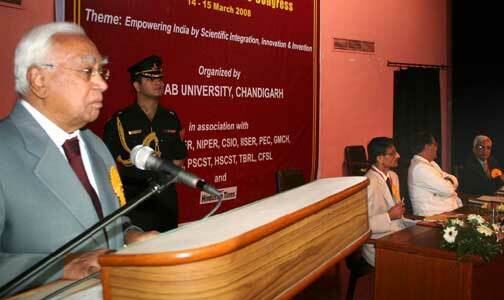 CHANDIGARH, March 14, 2008: His Excellency, Dr A R Kidwai, Governor,Haryana, inaugurated the two day 2nd Chandigarh Science Congress:CHASCON-2008 at Panjab University Auditorium here today. The Congress is being held in association with various organizations in and around Chandigarh including PGIMER, NIPER, TBRL, CSIO, IMTECH, PEC, GMCH, CFSL, IISER, NITTTR, HSCST and PSCST. The theme of the present Congress is “Empowering India by Scientific Integration, Innovation & Invention”. This Congress is a historical event as it is a part of Diamond Jubilee Celebrations of Panjab University.In his inaugural address, Dr A R Kidwai appreciated the pioneering efforts made by Panjab University in providing a common platform for exchange of ideas for city scientists under the dynamic leadership of Prof R C Sobti well ahead of the other institutions. He emphasized the suitability of Panjab University and Chandigarh in providing a lead in matter of collaborative research and appealed to the other institutions to join hands with Panjab University in this laudable attempt. He congratulated the Vice Chancellor for his vision and wisdom in bringing the scientific community together. He appealed to the younger generation to avail the opportunities make India a power center of knowledge. He made a note of the serene atmosphere of Chandigarh, where academic and research activities can be promoted and thus can become a center of scientific research. the constitution of the Chandigarh Academy of Sciences in April 2008.
achievements of various institutes of Chandigarh region and departments of Panjab University. outstanding young scientist among each section according to Dr. Ranju Bansal, University Institute of Pharmaceutical Sciences, P.U.